Ethnic minority children now comprise over 75 percent of students in 100 of the largest cities in the United States. However, these students have not been given equal access to, nor benefited from, the contemporary mental health system as have their non-minority peers. TEMAS (Tell-Me-A-Story) Assessment in Multicultural Societies examines the health/mental care system in which professional service providers, including psychologists, labor to offer quality care for youth in the United States. 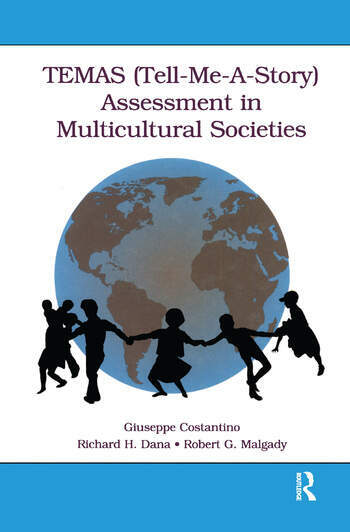 The authors ardently support the use of the TEMAS assessment instrument as a useful tool for diagnosis of all youngsters, particularly its use on the growing population of minority children and adolescents. Part I presents a rationale and context for employing TEMAS. Introductory chapters describe the mental health status of the population at-risk, as well as systems of care for youth where assessment and intervention are components. Topics to follow highlight a history of positive TEMAS test reviews with the detail required by instructors for preparing dedicated TEMAS courses. The volume thoroughly outlines cross-cultural studies and illustrates case examples of European-American, Hispanic/Latino, Asian-American, and forensic studies. TEMAS (Tell-Me-A-Story) Assessment in Multicultural Societies brings practical insight to instructors who teach standard assessment courses; clinicians, counselors, and school psychologists; assessment specialists; and administrators concerned with mental health services designed for children and adolescents. Part I: Introductory Considerations. Child-Adolescent Mental Health Needs and Services. Promoting Cultural Competency in Mental Health Service Delivery. Picture-story Performance Instruments for Children and Adolescents. TEMAS: Description and Development. Part II: Essentials of TEMAS Assessment. Administration and Scoring. Psychometric Properties. Cross-cultural Findings. Part III: Clinical Utility of TEMAS: Case Studies. European-American Case Study. Hispanic/Latino Case Study. Asian-American Case Study. Diverse Cross-cultural Studies. Forensic Case Study.